Ready for a break from pepperoni? 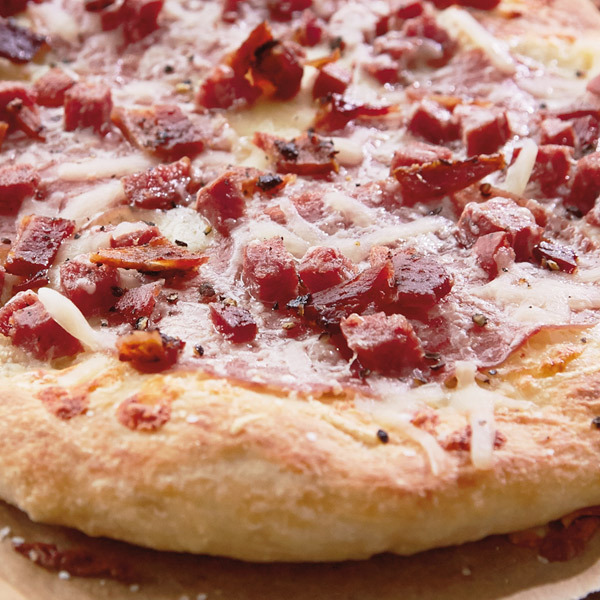 Salami makes a delicious alternative in this meaty masterpiece—basically a carnivore’s dream pizza. Generously top your favorite homemade pizza dough (psst...try ours!) with sliced salami, smoked sausage and crispy bacon, sprinkle with grated Parmigiano-Reggiano cheese, and cook it in your covered grill. WARNING: Our simple and satisfying grilled meat pizza recipe may ruin you for frozen pizza in the oven forever. At least 2 hours before baking, remove dough from refrigerator and shape into a ball by gathering dough towards bottom and pinching shut, placing the seam side down. Flour well and place ball in a medium-size mixing bowl. Cover tightly with plastic wrap and allow dough to rise at warm room temperature until roughly double in volume. Prepare the grill for direct cooking over medium-high heat (350°F to 450°F) and preheat a pizza stone for at least 15 to 25 minutes. Press out 1 ball of dough into a rough 8-inch circle, leaving outermost edge about 1-inch thicker than the rest. Gently stretch dough by draping over knuckles into a 12- to 14-inch circle about ¼ inch thick. Transfer to a pizza peel covered with parchment paper. Salt pizza dough with kosher salt, brush the dough with garlic olive oil, and then sprinkle ¼ teaspoon crushed red pepper evenly. Next, sprinkle half of the mozzarella in a single layer. Evenly distribute the salami, smoked sausage and bacon on top of the cheese. Then, sprinkle half of the grated Parmigiano-Reggiano cheese on top. Slide the pizza on the preheated pizza stone. Grill with the lid closed, until the crust is golden brown and the cheese is melted, 10 to 12 minutes. Halfway through the cooking time, turn the pizza and add the rest of the mozzarella and Parmigiano-Reggiano cheeses. Using the pizza peel, transfer the pizza from the stone to a wire rack and let the pizza rest for 5 minutes. Before serving, lightly drizzle the pizza with garlic olive oil and sprinkle with black pepper. Cut into wedges and serve warm.